On crossing the road follow the right hand of the two footpath signs. Aim just to the right of the copse seen on the ridge. The path leads uphill to a stone stile set in the stone wall. Carry on uphill to meet the farm road leading to Pendle Side. Take the second track on the left following the painted sign to Pendle. The four reservoirs viewed on this walk supply water to local towns. The Upper and Lower Ogden Reservoirs are supplied by water from Ogden Clough; the Upper and Lower Black Moss Reservoirs by Black Moss Beck. 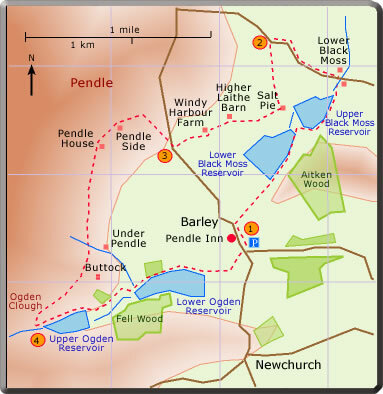 It is not surprising that reservoirs are found at the foot of Pendle. A local saying: "if you can not see Pendle it's raining; if you can see Pendle expect rain'. The first leg of the walk from Barley to Black Moss Farm is a pleasant stroll between the two reservoirs on the left and Aiken Wood on the right. After a walk uphill along the road, the next stretch generally follows the contour in the shadow of Pendle passing through a series sheep pasture and farms. On reaching Ogden Clough the final leg back to Barley passes close to the two Ogden reservoirs. The walk offers a continuous change in scenery: fellside, water, wood and pasture land. The Pendle Inn or the Barley Mow are popular final resting places.